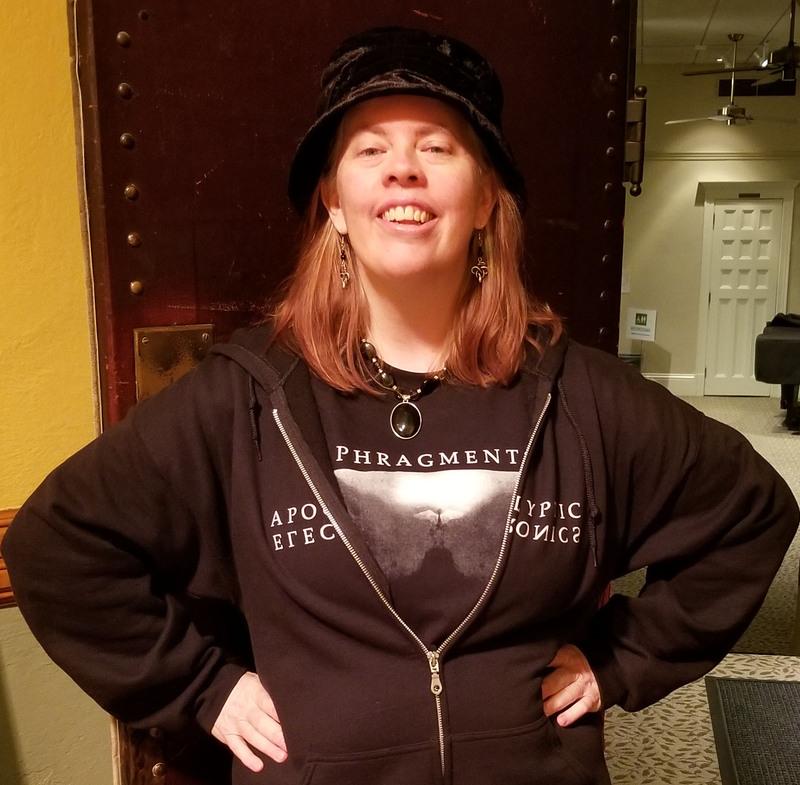 Danica Swanson and I came up with this crazy idea that our readers might be interested to find out more about the people behind our projects (Endarkenment and This Is Darkness, respectively). So we set out to do ‘cross-interviews’ of each other. We conducted these as ‘double-blind’ interviews, with both of us sending a list of questions to the other; so neither our questions nor answers would be influenced in any way by the other person. We also decided that it would be best to share both of these interviews together on each of our platforms. So you can read both full interviews in either place. This is a massive article, so without further ado let’s jump into it! A curious outsider asks: why do you love dark ambient? An online discussion forum for dark ambient? Michael: Thanks so much Danica for coming up with this idea of a cross-interview. I am really looking forward to finding out more about you and your work. I know you have a lot more history with the genre of dark ambient than I do. So, I would be interested if you could tell us a little bit about how you first got into the genre and if there was a specific artist which first drew you in. Danica: Shortly after I discovered industrial music in the early 1990s (Skinny Puppy was my gateway band), I bought Lustmord’s Heresy while browsing industrial CDs. At the time I had no clue that dark ambient even existed as a genre. I bought Heresy on a whim because I liked the subterranean cover art. It took me awhile to learn to appreciate it, but I now consider it my dark ambient gateway album. Mostly I was known as a rivethead; I was thoroughly ensconced in the club scene in the 1990s and loved to dance to industrial. It was also very difficult to find dark ambient music where I lived at that time. You had to know the right people who could hook you up, and I didn’t have those connections. However, I remember being completely transfixed by certain instrumental tracks on goth/industrial albums (e.g., “The Springs and the Stone” by Ordo Equitum Solis; “Angels on The Bottom” by Xorcist) and wanting more. I also recall hearing intros or passages in certain tracks and wishing the whole track could be like that. Instrumental sections often lulled me effortlessly into meditative states, but I found the percussion or voice samples jarring enough to jolt me out of my reverie. So I started to gravitate toward music that wouldn’t interfere with the “pure” instrumental meditative experience I craved. Later on I discovered masterpieces like Nordland (the original 2000 CD release by Apoptose), Cathedron by Sephiroth, Deadbeat by Desiderii Marginis, and Eliwagar by Skadi. After that I really got hooked. I mean, I’ve loved many types of music since I was a kid, but these albums kindled a voracious hunger for more that only a fellow music nerd would understand. Lustmord may have opened the gate for me, but it was Sephiroth, Skadi, Desiderii Marginis, and Apoptose that turned me into an insatiable dark ambient junkie craving a fix. After that I sought out dark ambient music actively, and met other fans of the genre online. I used Discogs, YouTube, and the similar artists feature on last.fm to research artists in the genre, and started digging up interviews. My obsession heightened even more in the late 2000s when I found a lot of the artists I loved on social media. I posted scores of giddy comments on musicians’ Facebook pages. I was like the proverbial kid in a candy store: “Where have you been hiding all my life with this incredible music?! ?” Keep in mind that I came of age before the days of social media (and before the web, even), so it thrilled me that it had become this easy to not only learn about them, but also talk to them directly. I’ll bet some of them were a little suspicious of that level of fangirl-squee. Dark ambient artists aren’t used to adulation. Heh. I regret nothing! Of course, eventually I got to know them as fellow human beings and left that stage behind, but my passion for the music continues to grow. Every time I think I couldn’t possibly love this music even more than I already do, I’m proven wrong. Over 25 years now and I’m still going strong. I recall being surprised by how small the scene actually is, though. I knew this music wasn’t mainstream, of course, but for some reason I assumed that dark ambient must have a dedicated scene surrounding it that is at least as large as the goth-industrial scene. Surely there must be enough fans of dark ambient out there to fill a venue regularly in cities all over the world, so I can get my fix of this stuff in a live performance setting? Not even close, unfortunately. Anyway, that’s my “conversion story.” I still enjoy other kinds of music, for sure, but I consider the dark ambient community my home. Michael: Your main focus related to dark ambient is your Endarkenment newsletter. There are a small variety of post-industrial/dark-ambient focused websites and printed zines, but Endarkenment is the first I’ve come across that follows this email newsletter format. What do you feel makes the newsletter format the perfect choice for you? Danica: Well, for starters, most people check email more reliably than websites. Email means delivery is guaranteed; there’s no worry about missing an issue because a social media algorithm filtered it out, or it scrolled by too quickly for readers to catch it. There are no shipping expenses either, which enables me to reach an international readership at lower cost than I could through print media. I also think the media climate is ripe for a resurgence of email as a decentralized platform to reach readers, as disillusioned and burned-out people continue to scale back their social media consumption habits. To answer that question properly, though, I need to go into a fair bit of depth about how the newsletter works and why I’m experimenting with the funding model behind it. Paid email subscription newsletters didn’t even occur to me as a potential format for professional music writing until I stumbled upon Substack, the platform that lured me away from Patreon. As I researched Substack’s publishing model, it dawned on me that I could use it to serve as a kind of corrective countermeasure to the dominant structures that exploit artistic labor in our niche music scene. I often describe Substack as “Bandcamp for writers.” Although they’re still in beta, they’re growing quickly and attracting popular writers, some of whom now make their living by publishing paid newsletters. My newsletter offers two subscription tiers: the default all-access (free) tier, and a sustaining access tier (paid either monthly or annually). Both tiers get substantive material to read, there’s no advertising anywhere, and readers can upgrade according to their interest level and budget. Substack takes 10% of writers’ revenues. I direct half of net income to the artists I feature, and the rest of the funds go back into publishing new issues of the newsletter. Back issues are also organized into a web archive, so subscribers can read them that way if they prefer that format over email. Readers get immediate access to the full archives if they upgrade, and they can leave comments for the musicians (and other readers) on archived issues anytime, as they would on a blog or web forum. Readers can familiarize themselves with my work via the all-access pieces, and if they want to read more, the platform makes it simple and seamless for them to pay for full access. So it’s similar to the way Bandcamp enables fans to buy music directly from musicians. The reader-supported aspect provides a way to maintain a strict separation between editorial decisions and funding sources without compromising my own need to be paid for my work. That’s important, because this venture is rooted in trust and solidarity with the dark ambient community as a whole. I don’t want to feel obliged to provide coverage to specific artists or labels, as that would compromise my readers’ trust and eventually lead to burnout. This publishing model offers the possibility of long-term sustainable funding for the newsletter without resorting to advertising. The net-income-sharing aspect was my own decision—it’s not a required feature of the platform—but it’s essential to my long-term vision for the newsletter. It’s my way of recognizing that the newsletter wouldn’t even be possible if not for the combined efforts of an entire music community. Underground music communities—like the arts in general—rely on a great deal of unpaid, unrecognized labor. One of my goals as a writer is to make that labor more visible, and make listeners more aware of the price we pay collectively, as a community, for our heavy reliance on unpaid labor. It’s a topic we rarely discuss openly. Take interviews, for example. As a fellow writer, you know that a great deal of work, thought, and time goes into producing good interviews. All that labor happens behind the scenes, however, so it’s easily disregarded when audiences only see the finished product. In the dominant publishing models, nobody gets paid for interviews—neither the writers nor the artists. With Substack’s model and a critical mass of subscribers, the newsletter could support the time and work of both the interviewer and the interviewees. I love good interviews—I want us to have more of them! With more funds available to pay professionals for their work, we’ll have higher-quality music publications, which in turn attract more listeners. So there’s potential for a positive-feedback loop. Net-income-sharing is also my way of recognizing that time, skill, attention, and trust are forms of currency. The idea is to do what I can to honor all the years of research, skill development, listening time, editing time, and emotional labor required to produce art. We need corrective countermeasures like this because almost everyone in this community has time-consuming day jobs. I’m sure I’m not the only one who’d rather have them making more art. Most sources indicate that recording industry revenues are up, but musicians are poorer than ever before (and it was pretty bad before, too). Many listeners don’t know that even respected veterans like Peter Andersson of raison d’être don’t draw anywhere near enough income from their music to enable them to devote themselves to it as often as they’d like. Most artists not only work their tails off to do creative work on top of their day jobs, but pay out of their own pockets to do it. There’s something fundamentally wrong with this picture. Now, of course some musicians prefer to have day jobs, which is their prerogative. My hope is to use the newsletter as a means of directing funds to artists who’d like to quit or reduce time at their day jobs so they can make more art. We miss out on a great deal of art because so many professional artists are forced into day jobs to pay the bills throughout their entire careers. There’s a common misconception that says it must be individual shady behavior, irresponsible business management, or lack of proper promotion that deprives artists of their proper share of income. But this problem isn’t really anyone’s fault. Even in cases where poor management factors into the mix, most of the problems depriving the scene of funding and squeezing artists out of the loop are structural, not individual. While I know the structural problems are beyond my control, one of my main goals with the newsletter is to help make things easier for musicians so they can make more music. An increase in high quality music benefits all the future listeners, not just me. So I do what I can to further a hopeful vision of a thriving dark ambient scene. An effective way to do that is to provide more financial support. “Exposure” doesn’t pay the rent. Platforms such as Patreon and Bandcamp are steps in the right direction for some artists, but we’ve still got a long way to go. At the moment, the fanbase for dark ambient may not be large enough to support all the musicians and artists at the level we’d like. But I’ve seen convincing evidence that there are many more potential listeners out there for this music, which is one reason I started the newsletter: to attract newcomers outside the usual channels. So there’s hope for the future, at least. Of course, I’m only one writer. In order for the corrective countermeasures I speak of to enact a more widespread shift, platforms like those of Bandcamp, Patreon, and Substack will need to become more normalized. I like to think big. I think this email subscription model has great potential, which is why I got on board early on. I’m keeping my eye on the long-term cultural and economic implications of models like this. I’ll bet Substack’s model can be successfully replicated by other digital subscription-based businesses, too. In fact, that’s exactly what I expect (and hope) will happen. Is the time ripe for this undertaking to gain traction? We’ll see. It’s still early days for the newsletter, but things look promising so far. If it continues to go well, perhaps one day I’ll reduce time at my own day job and write more about dark ambient music. But if not, well, I’ll simply keep publishing it as time permits. I’ll do what I can for the musicians who inspire me, even if it’s a mere drop in the bucket toward what’s needed. They’ve given so much to me already, and this project enables me to give back to them. That’s what makes the digital direct-subscription email newsletter the perfect format for me. I’m also a big fan of print media, though. Perhaps one day I’ll be in a position to publish the newsletter in print form as well as digitally. Time will tell. Michael: You’ve put a lot of focus so far into some great interviews with Ulf Söderberg (Sephiroth), Hypnagoga Press, and Northumbria. Do you plan to keep the momentum with these interviews or will there be a main focus on other areas at times? Danica: Features for the exclusive subscriber tier include a mix of interviews, profiles, tribute pieces, and occasional guest writer contributions. I plan to release an annual special long-read issue in October, as I did in 2018 with the Ulf Söderberg interview. Some of my musings on the history, philosophy, culture, esoteric aspects, and aesthetics of the genre will be all-access, such as my underrated dark ambient albums series, and others will be exclusives for paid subscribers. I don’t promise specific timing for each issue because I won’t cut corners or compromise on quality, even if it means postponing release dates. However, I do my best to release at least one new issue every month. Fortunately, my readers understand that top-notch work is time-consuming and I have a day job. Since they know I’m in this for the long haul and half of the funds go to the musicians no matter what, they’re very patient with me. For example, the background research for the Ulf Söderberg interview required me to dig particularly deep, and I ran into a series of time-consuming obstacles. He describes himself as “kind of a hermit” who eschews the spotlight and doesn’t do interviews often. There’s next to no information out there about his work in English, so I had to do Swedish-to-English translation work to even reach a place where I understood enough about his work to formulate appropriate questions for him. Even with Google Translate it presented a challenge for someone who’s still a beginner in Swedish. But of course it was well worth it! Fortunately, most of my interviews don’t require that level of background research. That said, I enjoyed the whole process immensely and I’d gladly do it all over again. He was a delight to work with, and I consider it a privilege. That interview is among my proudest accomplishments as a music writer, and it received fantastic feedback from my readers – the kind of feedback I’ll probably be re-reading for the next 20 years on days when I need a morale boost. It richly deserves to be published in print, so I regret that I don’t have the resources to make that happen. I’ve also given some thought to the fact that I live within reasonable travel distance of the home of the Cryo Chamber label in Oregon. If I had sufficient support and assistance, and there was interest from Simon Heath, maybe I could even do an in-person “behind the scenes” studio tour and multi-media interview with him for the newsletter someday. I’m sure my readers would appreciate that! Michael: Spirituality/religion/mysticism seem to be your main connecting place with this genre and the aspect of it that you focus on in your forthcoming book, which we can talk about a bit more later. Is this connector equally important with the newsletter, or are you looking at dark ambient from a more “generic” perspective in this format? Danica: The subtitle for the newsletter is “contemplative writing on dark ambient music appreciation,” and that includes—but is not limited to—spirituality. Music-based contemplative practices play a central role in my religious work, and that affinity definitely influences my writing style, but there’s ample room in the newsletter for insights of other sorts as well. In my university days I was an honors major in philosophy, and one of my goals is to transfer this “love of wisdom” into the newsletter, minus the academic jargon. That’s how I structure my interviews: I ask my interviewees questions on topics like philosophy of sound design, aesthetics, childhood memories, and emotions—things that encourage them to open up and reflect a little more deeply than a standard interview might. Who wants to read cursory interviews with boring formulaic questions anyway? If the artist doesn’t give you a peek into their inner life, and all you see is a polished public persona, I don’t think it’s worth the time and energy for either side. I approach all writing for the newsletter this way, not just the interviews. So spirituality is important, yes, but the larger focus is wisdom, introspection, and appreciation. Michael: We both seem to have an affinity for the Scandinavian dark ambient scene. Mine has a lot to do with basic aesthetics and my love of the frigid solitude which is so prevalent in that region’s sounds. Yours, however, I think is more in connection with your religious beliefs and heritage. I wonder if I’m correct in that assumption and if you’d like to talk a little about your particular love for the region? I’ve traced my maternal ancestral lineage to rural Östergötland and Småland, and next time I go to Sweden I hope to actually set foot on my ancestral motherlands at long last. My first visit was for the Cold Meat Industry 30th Anniversary event in Stockholm in November 2017. 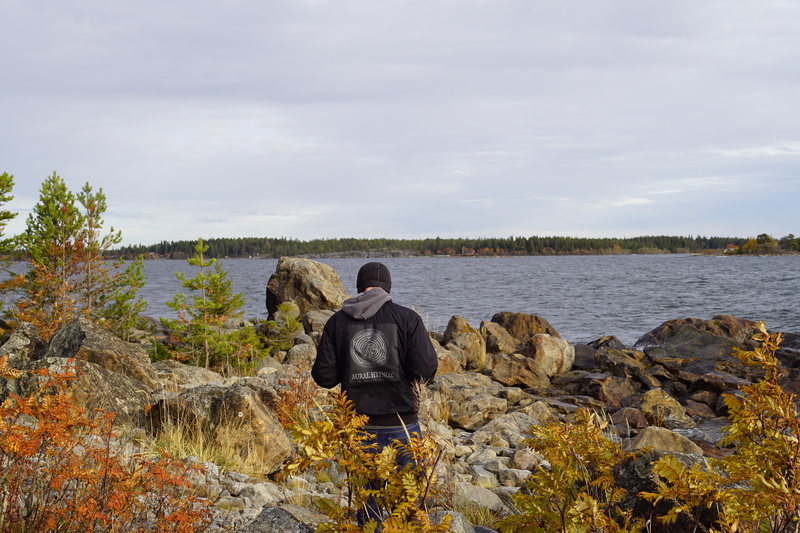 I met some of my favorite musicians and long-time online friends, and I fell in love with Sweden right away. The following week I stayed in rural Dalsland with close friends, and made a vow that I’d either move to Sweden one day or die trying. 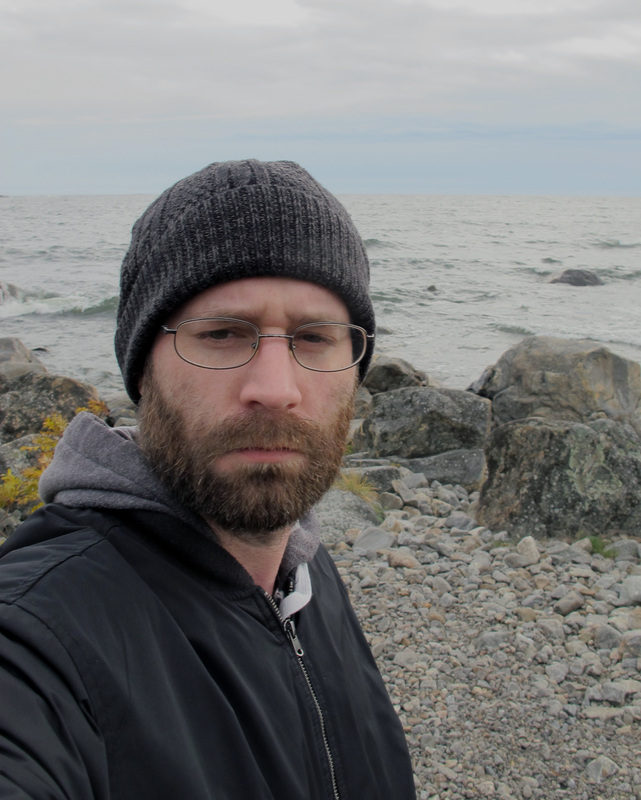 I also match the stereotype of dark ambient fans in that I love winter and I thrive in solitude, so that’s part of the attraction to Sweden too. When I find the right way to accomplish it legally, I’m planning to move to rural Västergötland to continue my work as a writer and property caretaker, and establish a religious Hermitage near my dear friends there. I’m self-employed and the work I do for my day job as a copywriter is location-independent, which gives me more freedom to choose where to live. I hope to spend the rest of my days contributing what I can to both the dark ambient community and the modern revival of pre-Christian Nordic spiritual traditions. I have a particular interest in theophoric place-names of cult sites in Sweden, especially those linked to Skaði. Though much of this is speculative, I hope to use what I learn to help build future shrine spaces. An interesting side-note: while I was searching for information about where my ancestors lived, I also discovered that one of the places where I’ve traced my maternal ancestors (Bäckaby in Småland) is a site where a church burning took place. It was linked to members of Domgård, a Heathen black metal band. I hadn’t heard of them and am not much of a metal fan myself, but I looked them up! Michael: ‘Endarkenment: The Esoteric in Dark Ambient Music and Culture’ is a book that you have been working on over the last few years. It is obviously a labor of love for you and I’ve been enjoying the little previews we get over time. How is progress coming along on this project? Danica: I launched that project in late 2013 with high hopes, but it proceeded at a snail’s pace for years due to health and financial issues that left me unable to write reliably. I started the book before the Affordable Care Act passed in the U.S. I was working as a house cleaner; I had no health insurance, and couldn’t afford the treatment I needed. The U.S. doesn’t so much have “cracks” in the social safety net; they’re more like gaping canyons, and if you lose your footing even slightly, you can end up in free-fall. Things slowly improved for me after Obamacare passed, and I finished the interview-gathering process for the book in 2018. I’m now editing the final round of interviews I collected a few months ago, and as soon as that’s complete I’ll move into the next phase of the writing process. I received over 30 completed interviews! The amazing Pär Boström of Kammarheit and Hypnagoga Press has agreed to provide illustrations and cover design for the book, so I’m excited about that. He also designed the beautiful logo for my newsletter. I’ve been keeping my readers informed about progress on the book through the Facebook page, but I’ll soon be deleting the page because I plan to leave Facebook. Henceforth I’ll deliver all updates about progress on the book through my newsletter. 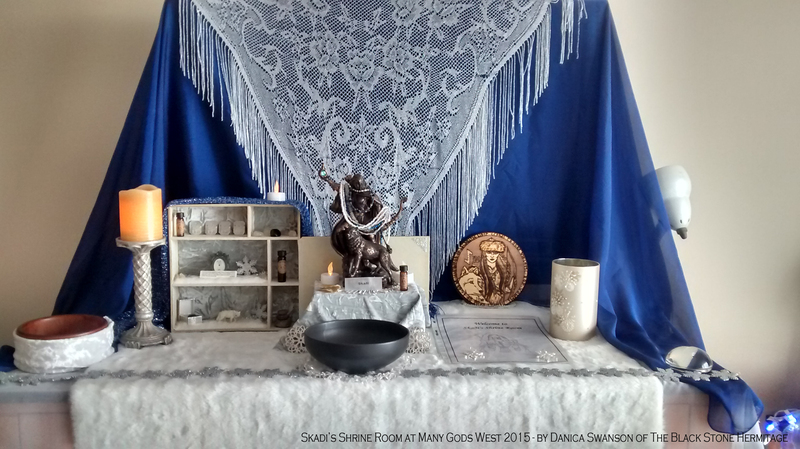 Shrine for Skaði by Danica Swanson at the Many Gods West conference, Aug. 2015. Michael: You run The Black Stone Hermitage, which is ‘a contemplative Norse polytheist monastic retreat and worship space in service of Norse deities and other Holy Powers of Yggdrasil’. Could you say a bit more about this service project? How has your love of dark ambient affected the hermitage? Danica: The Black Stone Hermitage is both a physical location—my live/work studio in Portland—and a concept through which I extend religious outreach and hospitality services to the communities I serve. 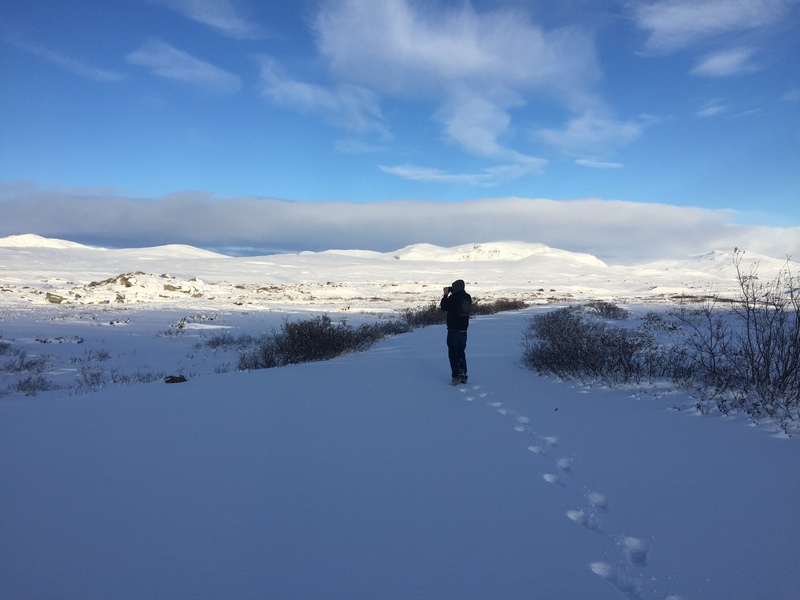 Since 2011 I’ve been developing an endarkened retreat space from which to write, publish, and cultivate a contemplative practice centered on Norse polytheism and animism. The online and in-person aspects of the project have developed roughly in parallel. I keep shrines for Skaði and some of the more obscure Ásynjur (goddesses). Once I’ve located the right space for these endeavors in Sweden and received clearance to move there, the next phase of the project will commence: the founding of a Norse polytheist Hermitage with a subterranean incubation space and “dark ambient church” available for visiting retreatants and votary. The Hermitage centers on the concept of sacred endarkenment. I sometimes describe it as the way of non-contrivance. The basic idea is to promote a healthy respect for the receptive wisdom to be found in darkness, both literal and figurative. The dominant culture doesn’t really “get” darkness as a force that can be positive and empowering — darkness tends to be associated with evil, so we often sweep it under the rug or look the other way, rather than embrace it. But as dark ambient fans know, darkness can be deeply restful, nourishing, and spiritually fruitful. Surrender to darkness can lead us to earthy sources of medicine, for example, and downward-moving emotions have wisdom all their own. Another aspect of sacred endarkenment centers on non-doing, deep listening, and facilitating stillness—needs that often go unfulfilled in a culture obsessed with productivity to the exclusion of presence. In her wonderful book Awakening the Spine, Vanda Scaravelli wrote that she approached yoga with “infinite time and no ambition,” and I aspire to something similar at the Hermitage. I try to cultivate non-coercive spaces where it’s appropriate and safe to relinquish control, get out of the way, and allow greater sources of intelligence to speak through these ventures. When I get this balance right, my practice “plugs in” to the flow of magic and gift, and this leads me to things I’d never find by dint of conscious effort and striving. How has my love of dark ambient affected the Hermitage? It’s probably best to ask: how hasn’t it? It facilitates my creative flow and contemplative practice. I choreograph dance pieces to it. It keeps me company while I practice restorative yoga. I fall asleep to it, and sometimes wake up to it. It’s brought many friendships and unexpected creative collaborations into my life. It’s given me opportunities to create themed playlists for yoga and meditation instructors. It helps me learn to perceive beauty in the most unlikely places. I listened to it on headphones for five years while working solo as a professional house cleaner, and I got into meditative rhythms. Some of my best writing ideas came to me that way. Dark ambient is particularly effective at keeping the “watcher at the gate” (as the German poet Friedrich Schiller wrote) occupied, so that my deep mind can take over when I write. Few people outside our community know how effective dark ambient music can be as an aid to meditation and liminal journeys. I’ve long wished for an expanded subgenre of dark ambient called “monastic dark ambient,” as I love chants, chimes, choral voices, church bells, orchestral elements, and guided meditations set to dark drone music. Some of this already exists, but nowhere near enough to slake my near-unquenchable thirst for it. I’ve been called “the world’s biggest dark ambient fan,” and while I doubt that’s technically accurate, anyone who knows me would probably agree it isn’t too far off. I can’t even imagine what my life would look like without dark ambient music. Perhaps you’ve seen that video about the “purple lady” who’s 76 years old and lives in solitude in the forest hugging trees, helping people in her community, and practicing witchcraft? If I’m fortunate, my future will look something like that—only I’ll be the “dark ambient lady” helping her community and practicing Norse polytheist monasticism in Sweden. And my Hermitage is decorated in both black and purple. Ha! Michael: Would you like to tell us a bit about The Black Tent Temple Project? Is this a project that is still active for you? Danica: A Black Tent Temple is a dark enclosed tent-like or cave-like incubation chamber used for mystical, meditative, and/or restorative purposes. Incubation, in the sense I’m using it, means lying down (ideally beneath the surface of the Earth) and either sleeping or entering a state described as “neither sleep nor waking,” to invite dreams and visions through forces inaccessible to waking awareness. It’s among the oldest of ritual practices. In Norse literature there’s also a wisdom-seeking practice called “going under the cloak,” which I also perceive as an incubation practice. Portable endarkened incubation spaces can be set up for all kinds of uses, including grief circles, blanket-and-pillow forts, deep music listening…whatever you can dream up. I also consider darkroom retreating a form of ascetic practice appropriate for a monastic. Ideally it would be done in a subterranean space, but I don’t have basement access at my Hermitage right now so I use a windowless walk-in closet appropriated for the purpose. It’s lined with floor-to-ceiling black velvet curtains and a ceiling drape, so it’s pitch-black. Originally it began as a psychomanteum—something I learned about by searching on the dark ambient project of the same name. I first wrote about the Black Tent Temple Project on my blog in 2012, and that post attracted inquiries from people interested in adopting the concept and building their own Black Tent Temples at pagan events. I always encourage others to take the idea and get creative with it! I’d love to see photos, as I’m collecting them for a future project. The project is still active in the sense that I occasionally make my incubation space available for visitor use, and offer suggestions on the topic to those who want to build one. But due to time constraints it’s been quite awhile since I’ve built one for an outside event, so it’s fair to say that aspect of the project is in hibernation or on indefinite hiatus, though not retired. Eventually I plan to contact some of the darkroom retreat folks to find out if there’s anyone in Sweden with whom I might work to build such a retreat one day. All in good time. Michael: You are also very passionate about dark fusion dance. Have you found much of a community to share your love for this or is it a few unique international souls? I find the concept very interesting, though with my back problems and aversion to dancing I doubt I’d be inclined to it! Danica: There’s a small but very devoted international dark fusion dance community that grew out of what started in the mid-2000s as the gothic bellydance, gothla.uk, and tribal fusion bellydance communities. 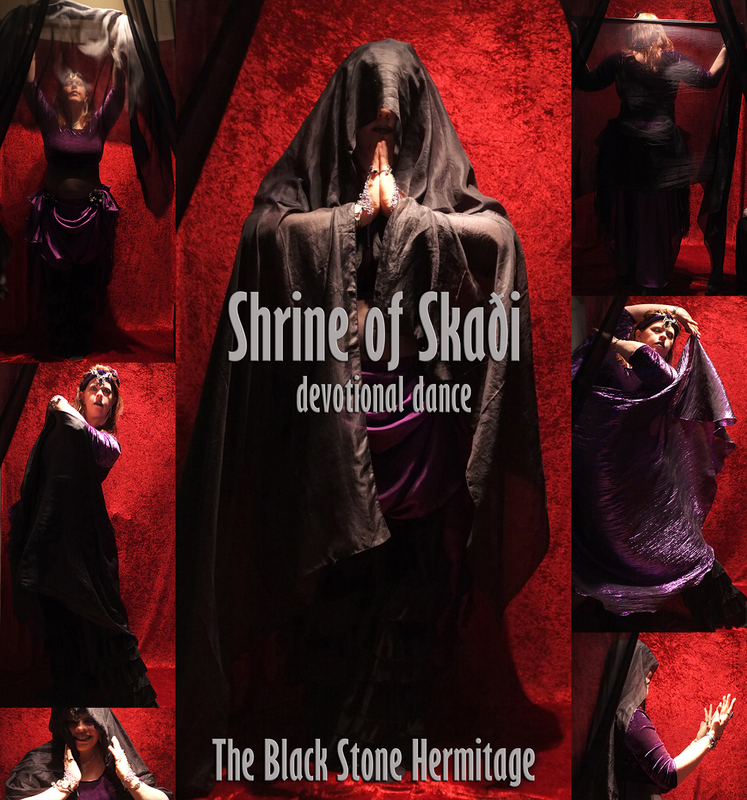 I’ve been a dancer since I was a teenager, and a bellydancer since I started my Shrine of Skaði devotional dance project in 2006. I don’t perform in public and don’t attend events anymore, though, so although I do consider myself part of that extended community, I’m on the periphery. Occasionally I perform veil dances to dark ambient music in religious contexts. A couple of years ago my dance practice got sidelined by a musculo-skeletal injury that forced me to give up dance for awhile and set aside some of my unfinished choreographies. Fortunately I’ve been able to ease back into it slowly, though only with corrective footwear. I’ve slowed down a bit and am unable to dance as often as I once did, but nonetheless I still love it and I intend to dance as long as I can. Veiled dance in particular is part of my religious practice; a veil is like a prayer shawl for me. Lamentation dance, too, plays a role in my practice, as it’s the best tool I’ve found for dealing with ancestral and ecological grief. If and when a day should come that I can no longer dance at all, I’ll take my cue from fellow bellydancer Bianca McCarthy and choreograph with whatever appendages I’m still able to move. Michael: So what does the future hold for you in relation to dark ambient? Will the book and newsletter remain the main focus for the foreseeable future, or do you have some other projects waiting for the proper time to be revealed? Danica: My interview schedule for the newsletter is already booked for many months, so for the near-term future I’ll have my hands full with that and the book. I’ll soon be working on interviews with Desiderii Marginis, Skadi, and Cryo Chamber. A guest piece from the talented Vladimir Gojkovic of For The Innermost is in the works for the newsletter too. That’s great news, because his blog was one of my original inspirations for the book, and I’ve been nudging him to write more about dark ambient music for years! Ulf Söderberg and I have also agreed to work together again at some point. The first interview drew such an enthusiastic response that I’ve been collecting questions from his listeners in the hopes that he’ll do a second interview for the newsletter one day. I’ll see what I can do! The newsletter is a kind of “prelude” to the book, and I’m in this for the long haul, so you can expect substantial new work from me in the coming years if the newsletter experiment continues to go well and my life circumstances cooperate with my ambitions. I’d like to publish the newsletter and write books as long as my cognitive capacities and vision continue to hold out! I’m especially happy about the publishing model for the newsletter because it gives me a vehicle to support dark ambient writing and music in a way that’s more than mere lip service. Artists put up with so much disrespect because the dominant culture doesn’t consider what they do to be “real” work. Often their time is treated as if it has no value, because many non-artists don’t see or value the incredible amount of work that good art requires behind the scenes. It’s often assumed that artists will work without pay “for the exposure,” because it’s a “passion project,” or simply because some audiences have been conditioned to expect access to art without paying artists adequately for it. The structural forces that siphon money away from artists and force them into no-win situations still aren’t well understood by the fans. If I do my job well and people value the newsletter, I’d like to think it could serve as a bit of a counterbalance to those structural forces. Admittedly a small one, but a shift in the right direction has to start somewhere. Perhaps the model will spread and dark ambient writers can collaborate to offer bundled email subscription options in the future, so more of us could afford to cut down our hours at the day jobs and spend that time writing about music instead? I can dream, anyway! What could our community be like if every musician were liberated to make use of their musical gifts to the full extent they wish, and every writer were liberated to write about music to the full extent they wish? What could our community be like if we could remove—or even mitigate—the conditions that restrict and suppress the fullest uses of our creative gifts? My hope for the Endarkenment newsletter is that it might enable me to contribute my part to building that world. One way or another, though, I’ll probably always be the dark ambient lady! Michael: Thanks so much for your time, Danica. Again, I’m very pleased we were able to do this! Danica: It’s been a pleasure indeed. Thank you for your journalistic integrity, and for all the work you’ve done on behalf of our community! Danica: Greetings, Michael. Thank you for this opportunity to turn the interview spotlight in your direction for a change! For readers who are not familiar with This Is Darkness, could you provide an overview of the project, the contributors involved, and the material you cover? 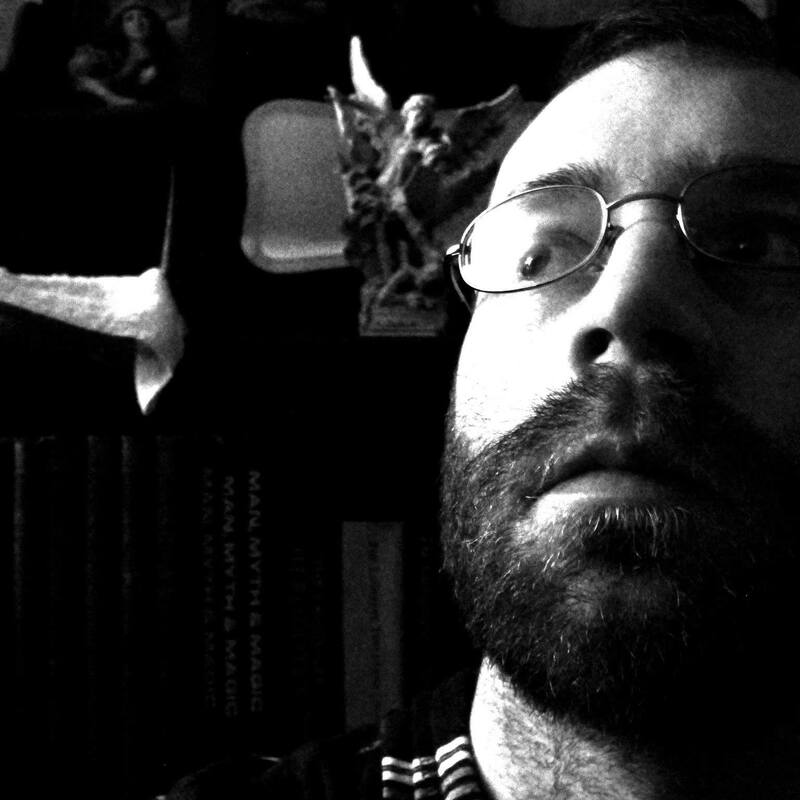 Michael: This Is Darkness is first and foremost a site for dark ambient fans. Through the ‘Frozen in Time’ articles I present a one-stop place for dark ambient fans to find all things relevant to the community over the previous weeks/months. There are also interviews, reviews, concert-coverages, mixes, etc. to help dark ambient fans find a greater connection to the community. I create 99% of the content for This Is Darkness myself, but I am always open to including other writers with something noteworthy to say. Since the start of the zine those other contributors have included Joseph Mlodik of Noctilucant (through his Inner Santcum vlog), Przemyslaw Murzyn (known throughout the community for his Santa Sangre zine as well as his Embers Below Zero dark ambient project), Maxwell Heilman (a very talented young journalist who is currently leaving his mark across a number of genres and zines), and most recently Gretchen Heinel submitted a wonderful article about her team’s hook suspension journey in Iceland. Danica: Can you tell me a bit about the history of This Is Darkness and your background as a writer? What factors influenced your decision to start the blog? Was it something you planned for awhile beforehand? Michael: The whole thing sort of started on a whim. I always enjoyed writing papers for research projects when I was in University, but I never really intended to be a “writer” of any sort. I majored in Archaeology/Greco-Roman History and intended to do field work in archaeology, but long story short, that never happened. Then in 2015 I injured my back and have become a hermit by default. I’ve always been passionate about music and will talk for hours about it whenever someone will allow me the opportunity. I had become obsessed with dark ambient over the previous five years and I was rabidly absorbing all the content about the genre that I could find. But I wanted more, and it wasn’t there. So I just decided one day to try writing a review of an album, something on Cryo Chamber that I loved at the time, I don’t remember which one. For the fun of it, I submitted the review to the Terra Relicta webzine and they asked me to keep writing. That seemed to go over very well and the community, to my great surprise, really took a liking to my reviews. I started This is Darkness as a place that I could put the occasional article or whatever else didn’t fit into the mix on Terra Relicta. But for a number of reasons, I came to the decision that I was creating enough content that it should all be focused on my own site. An offer by a great friend to cover the cost of switching from WordPress.com to a proper ThisIsDarkness.com was the final deciding factor. So I cordially parted ways with Terra Relicta, and This Is Darkness has become my main focus since 2016. Danica: I’m curious about your editorial approach and decision-making processes. How do you select which artists to interview, what to include in your Frozen In Time summaries, and which releases to write about? Do you have a system worked out? What sources do you rely on to keep you up to date on news in the genre? Michael:I would like to say that I have a very detailed and well-planned approach to these things, but I often work on intuition much more than data analysis. What deserves coverage is a very hard question to answer. I’ve become a bit more selective as time goes on, but I try very hard to keep an eye on everything that is happening outside the major labels. Though it should be kept in mind that these “major labels” in dark ambient/post-industrial are incredibly tiny and fragile in comparison to major labels in most other genres. For interviews, I try to have a constant balance of “big name” interviews and lesser known artists that deserve coverage. I have to build my credentials so one day I can interview David Lynch. That’s only partly a joke. For reviews, I focus most on releases that have physical editions. I don’t need a physical demo, but if a label or artist has put the time, energy, and money into creating a physical release, it really deserves a proper chance. The music itself is always the most important factor though. I would review nothing but digital albums if they were the best releases at the time in the genre. Increasingly, I’m covering topics that have almost nothing to do with dark ambient, but should be of interest to a majority of dark ambient fans. The loyal readers will hopefully enjoy these extras, but they are really there to help bring in more people. Sure, I want more people to come to my site. But the reason I started the site in the first place was to expand the fanbase of the genre as a whole. As for sources… sources are an issue. I started ‘Frozen in Time’ because of my frustration with the lack of sources to find a really comprehensive rundown of what has been released in the genre. I find myself laughing so often when I keep looking back to my own previous ‘Frozen in Time’ articles to find a piece of information. There are 30+ dark ambient groups on Facebook; the Reddit community only has three groups on the topic, but they aren’t very active. I subscribe to everything on Bandcamp related to dark ambient, then for each ‘Frozen in Time’ article I go through that list of notifications and listen to every single album that has been released with a dark ambient tag, unless the cover-art is so horrendous that it was clearly not of professional caliber. Some albums will be disqualified within the first 10 seconds of listening; others will find their way into the article. Danica: What originally attracted you to dark ambient music? Was there a particular “gateway album” in your early experiences with the genre that kindled your appetite for more? Did you know right away that this kind of music was for you, or did you find it to be more of an acquired taste? Michael: As I stated above, I have only been listening to dark ambient since about 2010-2011. That is a woefully short period of time considering the position I’ve found myself within the community. But I have done so much research and talked to so many decades-long fans and musicians over these years that I feel confident in my understanding of the present and history of the genre. But I’m always learning more, especially about the history. Since I was a child I’ve loved ambient sounds. I used to buy those new age ocean sounds and forest sounds CDs that they sell in gift shops. I loved them so much. But I also loved The Shining since I was way too young to be watching The Shining. It literally took almost three decades of my life for my loves of darkness and ambient sounds to finally come together in my discovery of dark ambient. The first artists I remember discovering remain among my favorites to this day. Northaunt caught my love for the north, Atrium Carceri caught my love for horror/apocalypse, and Kammarheit embodied the sort of ‘mystical hermit’ deep inside me that I forgot existed. After a while with these three artists, I found raison d’être and realized I had decades of music to discover! Danica: What would you say to a curious outsider who asks you to explain why you love dark ambient music? 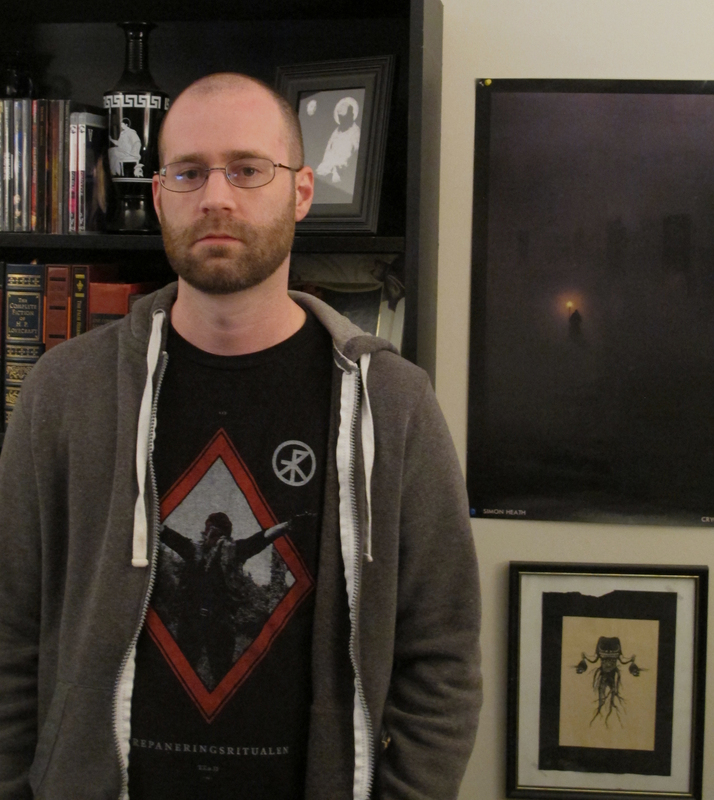 Michael: Over the years of writing reviews, I’ve found a lot of reasons to love dark ambient. The main selling-point for me is the sheer breadth of uses it can be put toward. Of course, not every album will work for every purpose. But with a bit of searching one can find perfect albums for: yoga, meditation, night driving, night walking, hiking, studying, reading, enrichment of ritual space, sleep-aid, replacement soundtrack for video games, and I could continue on. Not only is the music enriching in all these spaces, but these categories can all be broken down further based on mood + activity. Aside from classical and the more mainstream forms of ambient music, there is really no other genre that can be matched perfectly to all these scenarios. While the above examples were the main ‘selling-points’ for me on the genre, it really was love at first listen. I always wanted to hear dark classical, dark jazz, dark ambient, etc. unfortunately, none of these genres presented themselves to me during the 1990s and early 2000s in the U.S. As soon as I heard the likes of Atrium Carceri, Kammarheit and Northaunt, I knew I had found a genre that I would love until the day I die. Dark ambient takes everything great about ‘dark soundtracks’ and adds the attention that is necessary to make something move from ‘creepy soundscape in movie’ to ‘brilliantly executed album’. I no longer have to watch Lost Highway or Eraserhead to be transported into another world; I can now just turn on my stereo and pick exactly which ’emotional landscapes’ I would like to traverse on any given evening. Danica: As a music writer, you’re in a position to offer informed commentary on the dark ambient community in general. In your article “The Dark Ambient Community at Large,” you wrote: “I honestly can’t think of another genre which has such a global yet close-knit community of artists.” Could you expand on this? What are your thoughts on how such a uniquely welcoming atmosphere of camaraderie prevails in dark ambient even with its global reach? Michael: Well, since I wrote that article I have found a number of fractures as well as bad apples in the community. I suppose it is impossible to avoid these things in any group of any size. But, I absolutely stand by the article to this day. As I first forced myself upon the scene back in 2015, I was especially overwhelmed with the kindness and optimism of the people with which I spoke. Seemingly any artist I contacted, with the most basic of questions, would be more than happy to go into an in-depth conversation with me about the topic at hand. After spending years in metal scenes I was totally shocked by the lack of ego and narcissism in my dark ambient contacts, as I assumed these character flaws were prevalent in any genre. I would point to Miljenko Rajakovic of TeHôM as one example. He seems to be on a non-stop journey around Europe and the rest of the world, making friends, smiling, hugging, hiking, enjoying life. He seems to leave behind him a trail of new friends and happiness wherever he sets foot. To hear his music, one would assume the man is sitting in a basement somewhere counting down the days to the apocalypse. Another example is Simon Heath. While some may have issues with him, I have found the man’s integrity to be exemplary. He left the dying embers of Cold Meat Industry and in a matter of two or so years had set up one of the most successful post-industrial labels ever. He did that by connecting to the community, connecting to the artists on his label, connecting to artists outside his label, connecting to people like me, the journalists of the scene. I should say that Simon gave me all sorts of recommendations and tidbits of information about the genre while I was still trying to figure it all out. Long before I ever wrote my first review. To anyone that has ever thought I might cover too many Cryo Chamber releases, keep in mind that I would not be doing this at all if it weren’t for the passion that Cryo Chamber and Simon Heath presented. I really can’t overstate their indirect influence on my own passion for the genre. I think the global reach of the genre is the main element that leads to this sense of camaraderie. The genre is incredibly tiny in comparison to almost any other genre. In the 1990s we saw most of this stuff coming directly from Cold Meat Industry. But as the internet took over the world, we were able to spread our interests farther. Without that one centralized label/scene, people weren’t as inclined to compete; they seemed more obliged to cooperate. The nature of the music also makes it possible to do intercontinental collaborations in a way that metal artists MUST envy. There are labels that release music by Russians and Ukrainians, Americans and Iranians, and so forth. It’s really a beautiful thing to witness. Danica: Dark ambient began its life as a subgenre of industrial music, and many dark ambient listeners find our way into the genre through gothic-industrial subcultures, black metal, and film or gaming soundtracks. I know you and I share a goal of getting the word out about this obscure music to those who might not encounter it through the traditional channels. What does the “pipeline” into dark ambient look like these days from your vantage point? Have any of your readers been converted into dedicated dark ambient listeners through unexpected routes? Do you think the community is growing? Michael: Unfortunately, I don’t have a very direct dialogue with readers. I have been decrying a need for many less dark ambient related groups on Facebook in order to direct people to the same places for dialogue. The dungeon synth community really has this aspect of communication on lock-down, as their Facebook group draws tons of conversation on a daily basis. I’m truly jealous! With that said, Facebook is becoming a cesspool and probably 50% of the site traffic has become direct site visits, instead of referrals from Facebook as it was in the past. I try to cover anything and everything possible to draw in fans of some other genre/medium to dark ambient. Topics like horror, true crime, brutalism, David Lynch, Lars von Trier, etc. have vast fanbases which would all find something to love in the dark ambient genre. If the 120,000 subscribers Cryo Chamber has on their Youtube channel is any indication, then yes, the genre is growing quite quickly. Getting these 120,000 people to actually buy albums might be a different story though. Times are tough, worldwide. So the decrease in sales many labels are seeing isn’t necessarily an indication of lack of interest; it is likely a lack of disposable income. We need listeners/readers to realize that the labels and zines they follow are all in the same situation as them. When it comes to eating dinner out one night a week or buying a few physical albums I hope people will see the lasting value and positive effects of staying home and buying the album. But each person makes their own decisions. Danica: One of your most widely circulated articles is “Dark Ambient 101: Understanding the Technicalities”—a long-read article exploring technical equipment, creative workflows, and general advice for those interested in making this kind of music. For this piece you posed the same set of questions to 14 dark ambient musicians separately, and juxtaposed their answers. (Quite an effective way to reveal some of the salient differences in approaches to music-making, since there were no opportunities for their answers to influence one another in advance!) Many non-writers are unaware of how much time and effort is required for an interview project of that sort, and you’re a prolific writer in general. I wonder if you could share a bit about how you manage the logistics of your creative workflow behind the scenes. What factors—personal, environmental, and/or structural—enable you to dedicate yourself so thoroughly to your music writing? Michael: That article took at least 6 months to create. There is the constant necessity of answering confusions/concerns/deadlines that any given artist wants to verify. Of course, the writing of the questions was a daunting task, itself. But by far the hardest part of the process is just the mundane work in editing the English grammar of answers and formatting the article itself for readers to properly absorb such a massive amount of material. I spent many hours just formatting. In the past, I’ve burned myself out on projects. Since I started writing about dark ambient, I made it a point to never push myself too hard. If I have the energy to write 5 reviews and a news article in one week, great. But if I am having a particularly bad week due to physical pain or mental anxieties, then I will allow myself to take that week off, guilt-free. Paradoxically, this seems to have led to even more output. Often, coming off a bad week, I will have so much momentum that I will work 14-16 hours some days on nothing but This Is Darkness related topics/material. Some of this will lead directly to new articles; other things will just become part of my better understanding of the genre and its history. It must be about passion. I try to allow all choices to be made with passion in mind. If I wake up and want to read or watch documentaries about a particular topic, I go with it, but then I try to find a way to make this passion available to the readers of the zine. For instance, I was very interested in hook suspension one week. By the end of the week, I’d gotten Gretchen Heinel to begin preparing a proper article for This Is Darkness about her hook suspension journey in Iceland last year. The article was all I could have wanted and is a major success on our website! Now there will be people interested in hook suspension finding their way to a dark ambient website for years to come! For another example, I love reading weird fiction from the early twentieth century. Recently, I’ve begun publishing old weird tales which have entered the public domain. I accompany these stories with dark ambient mixes that I create specifically for the purpose of listening while reading the story. This is fun for me, but it also cross-promotes weird fiction and dark ambient. Danica: What’s one thing you wish more people understood about what it’s like to be a music writer in a niche genre like dark ambient? Michael: The positive and the negative are both pushed to the extreme. I was able to make a name for myself within the community quite quickly because of the limited number of journalists with any focus on the dark ambient genre. However, in a larger genre once I’d made a name for myself I could assume that I would be able to monetize it easily and ride the journalism wave into the future with enough money to make ends meet along the way. There is no level of popularity in a tiny genre like this where I could imagine myself being able to even buy my groceries on income related to my journalism work, much less pay rent. The only reason I’m available to the community is because I’m living a hermit’s life on disability. Even disability wouldn’t help this though. I am also living with my brother, who pays the majority of rent and bills. If a day comes that I can’t continue living beneath someone else, I’ll likely be forced to return to the job-force regardless of the pain it would cause/increase or the passions I’d have to leave behind. Danica: Readers have often expressed interest in an online discussion forum for dark ambient music—preferably outside social media platforms such as Facebook, where groups mostly consist of link-sharing with little in-depth discussion. What are your thoughts on why our community doesn’t yet have such a forum? Are you seeing any hopeful developments in this direction? Michael: As briefly mentioned above, the dungeon synth community has two fantastic groups, one for the ‘elites’ and one for everyone else. I greatly admire what they are doing with those two groups. But it was mainly accomplished because people didn’t have 300 other dungeon synth groups to spread their voices out into obscurity. Reddit could work, but I really dislike what is happening there in the dark ambient groups. The only posts that get any upvotes are links to free mixes on Youtube, and comments are basically nonexistent. I am thinking really hard on this. I don’t have an answer aside from: the community needs to make the changes it wants to see. If you want to be involved in discussions go to a dark ambient group and start a discussion, or go to Reddit, or leave comments in Youtube videos or at the bottom of blog posts. I am doing all I can, but everyone has to join in for it to amount to anything. Danica: Someone who’s just getting into dark ambient as an aid to contemplative practices asks you for help in finding ideal albums to facilitate deep meditative states. Which albums would you recommend, and why? Michael: There can be so many options. Is there a need for a specific atmosphere? Is there a certain religion? These two questions can help narrow the options quite a bit. As a safe bet, I would recommend the Aural Hypnox label to people. Their consistency in sound and physical quality combined with their dedication to ritual/meditative releases makes them a perfect option for many people. If someone seeks darker territory there are labels like Black Mara that focus on darker religious/ritual elements. Then there are labels like Cyclic Law, Cryo Chamber and Malignant Records that all have a wide breadth of artists, some of which will surely be perfect for ritual/religious/meditative practices. Then there are labels like Hypnagoga Press that focus on mysticism on a more primal level, often devoid of the usual tropes of ritual ambient, like Tibetan singing bowls and bone flutes. I would be wary of artists like Lustmord. He performed at a Satanic rite, but has since showed very little understanding, appreciation or respect for that group. I bring this up because if a person is experiencing an album along with their meditative/ritual work, they should feel confident that the artist felt as strongly about its use in this context as the listener does. If the artist thinks rituals are a joke, then why are we listening to their music during said rituals? But to answer your question, I would safely recommend the latest Arktau Eos album ‘Eremos’, as well as ‘Void’ by Altarmang for more active meditative/ritual work. ‘Kundalini’ by VelgeNaturlig is a great new album I’ve been incorporating into my yoga practice. ‘Samadhi’ by Necrophorus (side project of Peter Andersson from raison d’être) is a classic for yoga practice as well. I’ve recently returned to reading Tarot (now with a proper Thoth deck) and I put ‘Saiph’ by Altarmang (from our first compilation) on repeat for the duration of the sitting. Danica: Could you say a bit about your vision for the future of This Is Darkness? I’ve noticed a recent increase in book and film reviews on the site. Do you plan to alter the mix of features going forward? Do you have any plans for additional compilations such as the massive 66-track Bandcamp release you published in 2017? Michael: The next compilation is right around the corner! Size and format will be similar to the last one, but there will be a little something extra this time. Stay tuned! I don’t see that I’ve altered the site’s vision really. From the beginning I wanted it to be a site for the dark ambient community. I have always wanted it to be a site to build the dark ambient community. I see the inclusion of books and films as a way of showing current readers interesting things outside the genre, while simultaneously bringing unsuspecting visitors to the genre. There is no better feeling than discovering a genre for yourself. If someone comes to This Is Darkness to see the review of The House That Jack Built by Lars von Trier or the beautiful new David Lynch ‘Nudes’ artbook, they are very likely going to be interested in dark ambient music. If they think they discovered it accidentally (and they really did), that is incredibly powerful for the psyche. Reviews are a major part of the equation, but they are certainly not the main and only reason for This Is Darkness. Some people will understand this better than others. For the novice listener a review is a way of making sense out of a new genre that makes very little sense in the beginning. But after a few years, listeners don’t need those reviews anymore really. They will have the same level of intuition about the music as I do. For those people, the ‘Frozen in Time’ news posts are a much more powerful tool that I offer for them to discover new music in a very long, yet simultaneously concise fashion. Those ‘seasoned’ readers will also be much more interested in my book and movie articles, interviews, mixes, etc. I am always looking for new features to add to the site. I don’t see any limits really. I do this for fun! Danica: Is there anything you’d like to comment on that I didn’t include in this interview? If so, please add it in! Michael: I don’t think so. I’m very pleased to have the opportunity to be on the other side of the interview for once. It is very strange, but very fun! Thank you Danica for the opportunity to speak in a way I usually can’t on This Is Darkness. Thank you so so much to all the people that have followed, supported, promoted, or cared in any way at all about This Is Darkness. You have all made my life meaningful in a way I really couldn’t have imagined five years ago. Namaste.